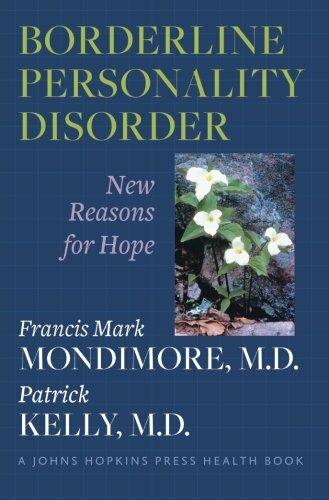 Borderline Personality Disorder: New Reasons for Hope — Kelly Psychiatric Associates, Inc.
Francis Mark Mondimore, M.D., and Patrick Kelly, M.D. "The book is thoughtful, accurate, and user-friendly." "Those who crave real answers about the debilitating complexities of borderline personality disorder will find them and then some in this well-crafted book. The authors avoid the subtle stigmatization of people who have BPD that is often found elsewhere. Instead, they offer compassion and hope. As one who has suffered from the illness, I can attest that their characterizations of what goes on in the heart and mind of someone with BPD are spot on. This is a great book!" "This thorough, compassionate, and readable discussion of Borderline Personality Disorder is essential reading for patients and family members. It will also be invaluable to both new and more experienced clinicians wanting to have the most up-to-date knowledge." "This exceptionally well-written book explains the many complexities of borderline personality disorder and dismantles much of the confusion surrounding the disorder. The authors are to be commended for a book that serves everyone in the BPD community: patients, family members, and professionals alike."